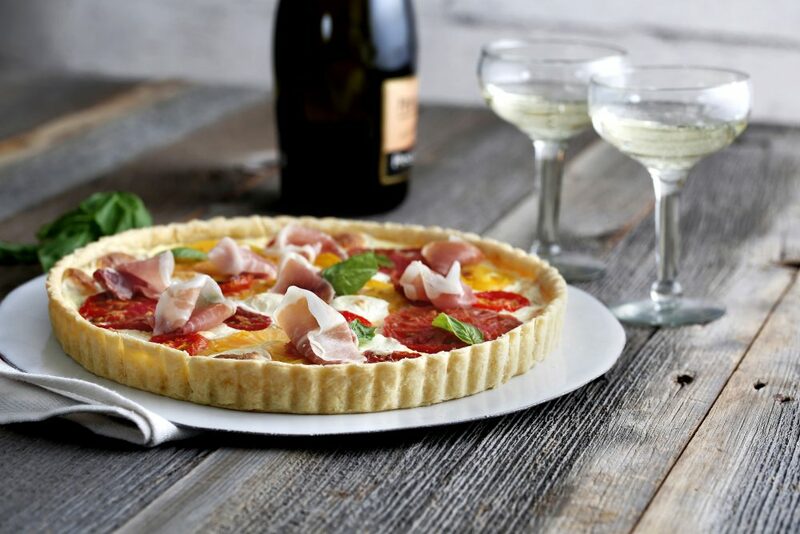 This Prosciutto, cheese and tomato tart might look complicated but trust us it’s easier than it looks. The creamy filling made with ricotta, fresh tomatoes, basil and prosciutto complements the buttery crust perfectly. Don’t have time to make your own crust? No problem. The prosciutto cheese tart can also be made in a store-bought pie crust. Serve with a green salad on the side for dinner and pour yourself a cold glass of prosecco or make it for a weekend brunch gathering. Preheat oven to 400°F. Grease a 10-inch tart pan with removeable bottom. Combine flour, butter and salt in a food processor. Pulse until mixture is crumbly. Add water 1 Tablespoon at a time until a dough forms. On lightly floured surface, roll dough out to 12-inch circle and transfer to prepared tart pan. Chop 2 slices prosciutto. Combine ricotta, egg, Parmesan, basil, garlic and kosher salt. Stir in chopped prosciutto. Spread cheese mixture evenly over crust. Top with sliced tomatoes and mozzarella cubes. Bake 40 minutes or until crust is golden. In the meantime, slice remaining prosciutto into strips. Arrange on top of tart. Garnish with fresh basil leaves, if desired.